C.R. 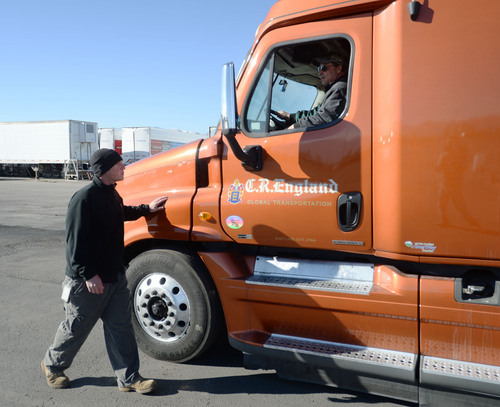 England • Salt Lake trucking company working to fill dual needs in the community. Steve Griffin | The Salt Lake Tribune Todd Dameron, a backing instructor for C.R. England Trucking, left, works with lead backing instructor, Mike Bemis, lower right, as they practice a straight line back up at C.R. England's driving course in Salt Lake City Monday, Nov. 18, 2013. The company is looking to hire 3,500 military veterans this year as drivers. Dameron is a Marine veteran who served from 1983-1990 and Bemis is an Army veteran who served from 2003-2009. Steve Griffin | The Salt Lake Tribune Todd Dameron, a backing instructor for C.R. England Trucking, right, works with lead backing instructor, Mike Bemis, as they practice a straight line back up at C.R. England's driving course in Salt Lake City Monday, Nov. 18, 2013. The company is looking to hire 3,500 military veterans this year as drivers. Dameron is a Marine veteran who served from 1983-1990 and Bemis is an Army veteran who served from 2003-2009. Steve Griffin | The Salt Lake Tribune Todd Dameron, a backing instructor for C.R. England Trucking, right, works with lead backing instructor, Mike Bemis, as they practice a straight line back up at C.R. England's driving course in Salt Lake City Monday, Nov. 18, 2013. 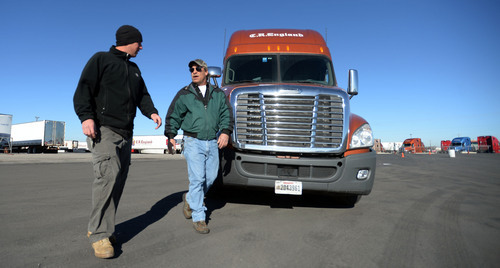 The company is looking to hire 3,500 military veterans this year as drivers. Dameron is a Marine veteran who served from 1983-1990 and Bemis is an Army veteran who served from 2003-2009. Steve Griffin | The Salt Lake Tribune Army veteran John Miller and Navy veteran Tiffany Hale, stand with Gene England outside C.R. England Trucking in Salt Lake City Monday, Nov. 18, 2013. 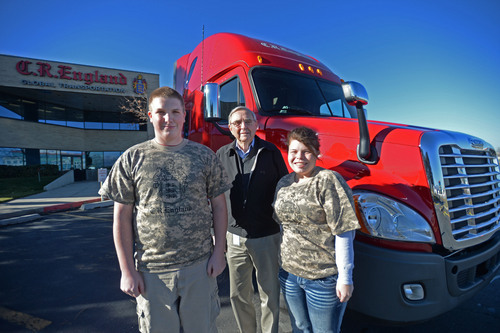 The veterans are students in the company's truck driving school. C.R. England is looking to hire 3,500 military veterans this year as drivers. 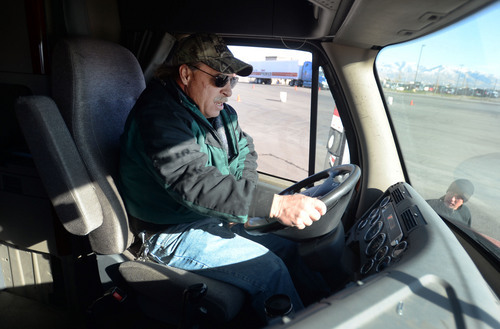 Since veterans need jobs and trucking companies are seeking new drivers, a program designed by Salt Lake City-based C.R. England Global Transportation to recruit and train veterans seems like a natural fit. "Drivers are an important item not only to us but to every trucking company in the world," said 94-year-old Gene England, whose family owns and operates the company. "We want veterans to meet the requirements for the best training. We want to treat veterans with the honor that they are entitled to." England ought to know. He is a veteran himself, having served in the 77th Infantry Division in Okinawa during World War II. He received the Bronze Star for his bravery. Thus far, England has hired about 2,000 drivers who are veterans. The company has participated in 85 veterans job recruiting events across the country. It hired Mike Lynch, a retired Army command sergeant major, as its senior military recruiter. And it began offering veterans a $3,000 tuition waiver at its five driver schools, including one in Salt Lake City. "Many veterans did not have the financial backing to come and go through training," said Lynch. "England did not want that to keep them from having a CDL." Michael Tucker, a 25-year-old Army veteran who was injured in Iraq and served six years, took advantage of the program. He said he dreamed of either being a fireman or a trucker as a child, and that his war injuries made it impossible to be a firefighter. When he noticed a C.R. England truck advertising its training program, the resident of Easley, S.C., called and signed up. He went through what he called truck boot camp and qualified for his license. He now runs a route up and down the East Coast. His only complaint is that he occasionally has trouble getting paid on time. "I am staying running and staying busy," Tucker said. "I love C.R. England. In a dog-eat-dog world, I am treated good." That said, Tucker said that it&apos;s a good idea for veterans to do their homework before signing up for a program. He knew one student who spent his last dollar going to the school, but after he finished the class, he was lacking some documentation and did not qualify. "It&apos;s different going from the military to civilian," said the driver. "In the military, there is a brotherhood and a backup. In the civilian world, you don&apos;t have that backup." Colin England, director of the England&apos;s driver advocates, said he works to make certain that drivers are treated appropriately. "We do everything we can," he said. "It&apos;s a tough lifestyle. Our challenge is to ensure that we are doing what we can to lessen that burden." Lynch said that veterans often bring good skills into the workplace. In the case of the trucking industry, the biggest issue is that many military vehicles use automatic transmissions while the trucks companies such as England use are manual stick shifts. "We have touch-point processes that drivers go through throughout their career," said Eric Ekberg, England&apos;s manager over driver processes. "We have to figure out opportunities on how to improve those touch points. You have veterans turning to another veteran for help with the challenges. We&apos;ve seen some of those veterans come to us as an advocate for the company to make some improvements in some areas." That said, hiring veterans has proven to be a good fit for the company. "A lot of them seem more prepared than some of the other students that haven&apos;t had the military training," said Trina Loy, who manages the company&apos;s Salt Lake City driving school, adding that veterans "are used to the fast-pace, high-demand stressful situation that we put them into." Mike Harper, a veteran himself, often trains some of the veterans who go through England&apos;s Salt Lake driving school. He said he finds veterans are often more dedicated and more responsible than other trainees and usually do well in the school. Stacy Brewster, director of England&apos;s corporate marketing program, said veterans were honored on Veteran&apos;s Day by having a flag at their desk, a special coin, and an appreciation card. The U.S. Department of Transportation&apos;s Federal Motor Carrier Administration is also working on a series of regulatory changes to further ease the transition of veterans into civilian jobs driving commercial motor vehicles. Some of the proposals would extend the period of time from 90 days to one year in which active duty and recently separated veterans can take advantage of a Military Skills Test Waiver. Another would update federal regulations to allow more than 60,000 service members trained to drive heavy vehicles that are nearly identical to civilian vehicles to immediately qualify for a CDL while on active duty. Finally, they would allow a service member who is stationed in one state, but licensed in another, to obtain a CDL before being discharged. Spencer Angerbauer, corporate vice president of driver recruitment and development for England, said one of the values of his company&apos;s program is that it can not only cover the charge of a veteran taking the program but can also guarantee a veteran a job at the end.